Pioneer has upgraded their affordable HDJ-X5 DJ headphones, adding Bluetooth® wireless technology to create the HDJ-X5BT. The new over-ear DJ headphones are ideal for DJing in the club and monitoring tracks on the move. 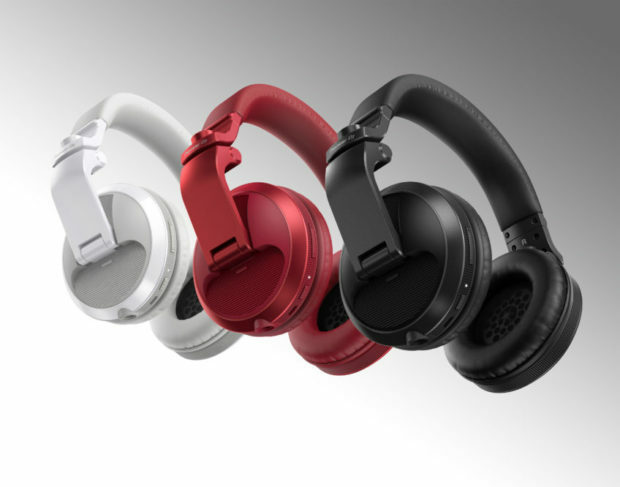 They are available in three colors: HDJ-X5BT-K (metallic black), HDJ-X5BT-R (metallic red) and HDJ-X5BT-W (gloss white). DJs need equipment that is flexible and seamless to help them practice, prepare and perform wherever they go. Thanks to its Bluetooth connectivity, the HDJ-X5BT headphones make it easy to monitor music in any situation – whether you’re at home or on the move. When you connect the included cable, you can also use them for comfortable DJing in the club. Whether you go wireless or wired, the HDJ-X5BT headphones offer the same outstanding audio quality, durability and functionality as the original HDJ-X5 model. The HDJ-X5BT headphones will be available from early-November at an MAP of $149. Watch the introduction video or find out more about the new Bluetooth headphones. With easy set-up, you can simply power up the HDJ-X5BT headphones and pair them with your Bluetooth device – such as a smartphone or PC/Mac – then start monitoring tracks. A 3-hour charge gives you up to approximately 20 hours of playback. Thanks to the built-in microphone, you can talk hands-free on calls when the headphones are connected to your phone*1. Original unique sounds for each beep when connecting via Bluetooth, powering and pairing, etc. *1 You can use these headphones for phone calls if the Bluetooth-compatible phone (cellular phone, smartphone, etc.) is compatible with the HSP or HFP Bluetooth profile. *2 MIL-STD-810G METHOD 516.7 SHOCK compliant. *3 Transmission distances are a guideline. Transmission distance may change depending on the surrounding environment. *4 Sometimes less depending on the conditions of use. Posted in DJ Gear and tagged DJing, headphones, Pioneer, VJing on October 11, 2018 by djnickjames.